The National Fairtrade Supporter Conference was held on 7th October at King’s College in London. Yorkshire’s own Holly Lynch gave a storming performance, motivating the delegates to action. Holly, who was re-elected this year as the MP for Halifax (with an increased majority) is Co-Chair of the All Party Parliamentary Group (APPG) on Fairtrade. Holly shared how important it is for Fairtrade groups to engage with politicians, and she also detailed the work of the APPG in promoting the Fairtrade agenda in Parliament. George Kporye, Fairtrade Officer at Golden Exotics Ltd, Ghana and Board member of Fairtrade Africa’s West Africa Network spoke about the impact of Fairtrade for banana workers in Ghana. Barbara Gwinnett, Chair of the National Campaigner Committee (NCC) spoke about the crucial role of grassroots campaigners in the Fairtrade movement, and how the NCC works with the Fairtrade Foundation to advise on its campaigning work. Michael Gidney, Chief Executive of the Fairtrade Foundation highlighted the progress of the Fairtrade campaign in changing trade, as well as the key challenges and opportunities for the movement in the coming years. Dario Soto Abril, CEO of Fairtrade International closed the conference with inspirational words linking the activities in communities across the UK and tangible shifts in living standards in communities around the world thanks to better prices and jobs that Fairtrade brings to millions of farmers and workers. Haworth, the world’s first Fairtrade Village, was the chosen destination for a Fairtrade fact-finding visit by Megumi Morita from Japan. She is from Zushi, Japan’s third Fairtrade town, which lies on the coast, south west of Tokyo. 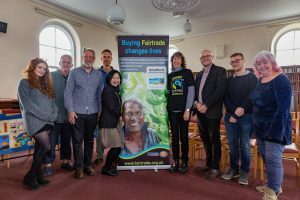 Fairtrade campaigners (from left) Ruth Drury, John Drury, Bruce Crowther, Chris Upton, (Megumi Morita,) Karen Palframan, Adrian Farley, Nick Drury, Rita Verity and others met in Haworth to welcome Megumi Morita from Japan. After attending the recent International Fair Trade Towns conference in Saarbrucken with Bruce Crowther MBE, founder of the global Fairtrade Town initiative and Director of the Fig Tree, Megumi came to the UK to discover more about collaborative Fairtrade initiatives in this country. Haworth Fairtrade Group members organised an informative itinerary, which included visiting West Lane Baptist Church, the Bronte Parsonage, Sonia’s Smile Fair Trade shop and the KWVR station in Haworth. The day started at the church cinema with photos and videos from past Haworth and regional Fairtrade events such as ‘Chuffin’ Fair’, ‘Fair Intents’, the cycling Fairtrade bananas ‘Tour de France’ video (filmed in Haworth for Fairtrade Yorkshire, see www. fairtradeyorkshire.org.uk), the ‘Sit down for breakfast, stand up for farmers’ KWVR steam train Fairtrade breakfast, and this spring’s Fairtrade and Bronte walk from Thornton to Haworth. 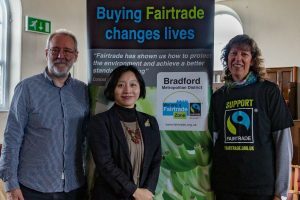 Megumi gave a presentation about Zushi’s activities to gain Fairtrade town status and there was time for her to discuss wider campaigning issues with Keighley Fairtrade group member and Bradford Council Fairtrade champion Cllr Adrian Farley, and chair of Bradford Fairtrade Zone, Karen Palframan. 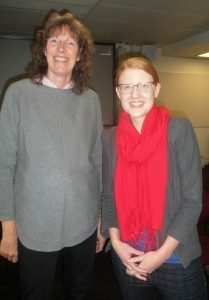 Diane Fare hosted Meg at the Brontë Parsonage Museum and explained more about Rev Patrick Brontë and his campaigns for social justice, including better sanitation, education and workers’ rights. Many thanks to Liz Barker and Worth and Aire Valley Magazines for kind permission to reprint this article. Thanks also to John Sargent for the photographs.